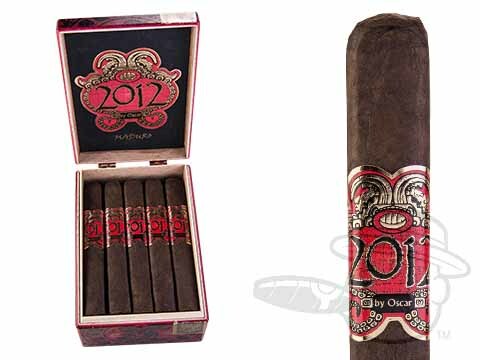 Paying tribute to Oscar Valladares five-year anniversary in the cigar biz, the 2012 by Oscar series revisits and re-invigorates one of his earliest original blends. The Mayan-themed artwork on the box and bands refers to the ancient Mayan prediction that the world would come to an end in 2012, but for Oscar, 2012 was just the beginning. A hearty filler/binder blend of Nicaraguan and Honduran long leaves finished with a sharp Cuban-style box press, the 2012 by Oscar Connecticut is adorned in a silky and delicate Connecticut-seed wrapper lending a mellow creaminess to its earthy, nutty, and slightly-sweet profile. Elegant and easygoing with a short, flavorful finish, the 2012 Connecticut embodies the skilled cigar blending and construction that has propelled Oscar cigars to the forefront of the industry in just 5 short years. a well made smoke, lots of flavor with an excellent draw. 2012 Oscar Maduro Toro is rated 4.9 out of 5 based on 2 customer ratings.